Since CAA’s founding, we have advocated on behalf of Chinese Americans who are systematically denied equal opportunities in many sectors of society. Over the decades, CAA led and contributed towards important reforms such as challenging discriminatory workplace hiring and promotional practices and successfully advocating for one of the nation’s strongest local hiring laws that has increased San Francisco resident hiring on City construction projects by nearly 50%. And throughout those years, CAA has helped immigrant job seekers in various sectors such as hospitality, construction, and restaurants. Today, CAA continues this work by connecting clients with educational resources, workforce training, and employment opportunities, as well as working with our community partners to remove barriers and increase opportunities through advocacy. 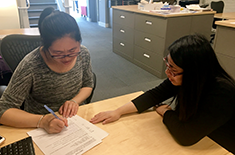 Locally, CAA is partnering with Chinese Progressive Association and City College of San Francisco to train limited-English proficient Chinese immigrants for jobs in the hospitality industry through our Hospitality Vocational Training Program. Through this collaboration, CAA provides intensive one-on-one job readiness services. CAA will be expanding this program to include computer and financial literacy skills building by collaborating with other Chinatown organizations in the fall. We will announce when we are accepting new applicants for this program. Additionally, CAA is a key member of the Goods Jobs for All Collaborative which aims to expand opportunities for employment by developing sector specific hiring policies that are inclusive of people who face multiple barriers to employment. Read more about the Collaborative here. Statewide, CAA, through the API Budget Partnership, established immigrants as one of twelve targeted populations to receive workforce development services via Assembly Bill 1111, which would create a grant program for community based organizations to address economic self-sufficiency. Given that Chinese immigrants make up a significant portion of the limited English proficient working age population and are affected by the widening income inequality in San Francisco, CAA will continue to play a strong role in providing culturally competent employment services and advocating for economic policies that directly benefit the most vulnerable members of our community.